Sketch B. No. 2 Showing the Triangulation & Geographical Positions in Section No. II From New York City to Point Judith. 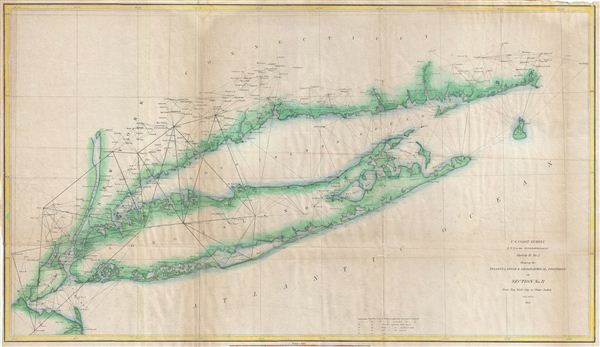 An exceptional example of the 1851 U.S. Coast Survey's progress nautical and triangulation chart for Long Island, New York. Covers from Staten Island and New York City eastward along Long Island and the coast of Connecticut to Block Island and Point Judith. Shows triangulation points throughout the region as well as all major islands, rivers, and inlets. Lighthouses, ports, cities, beaches, and other sites noted. Prepared under the supervision of A. D. Bache for the 1851 issue of the Superintendent's Report.